Editor’s note: Jung Won Park submitted his following personal story to Global Young Voices. You too can submit yours to us here. With the increased globalization of society and despite the existence of geographical borders and cultural differences, the commonality between all of us is becoming stronger. As our society continues to grow collectively in relation to each other, the idea of sustainability and the importance it holds for the long-term future cannot be ignored - the human factor of sustainability. Currently, there are 1.9 billion children in the world, approximately 20% of the population. Despite the growing numbers of children, the idea of youth education is one that is insufficiently studied. As the future citizens of the world, one that understands how interconnected our lives are with technology and social media, it is imperative for young people to come to the forefront of research now. Education is a fundamental tool that has sustained our society for hundreds of years, preserving values and ideas, while striving to provide a better and continuous quality of life for a larger population: a sustainable development. In order to sustain education for humanity, we must connect the opportunities and resources that we have available to help educate our counterparts in other nations that may not have the same accessibility on a local level. With this in mind, youth-led research can help bring together the ideas of modern generations for a more open and distributable use. Considering this focus on the importance of youth research and its academic impact on the global community, I have conducted a study on Early Childhood Care and Education (ECCE) to bring more awareness and provide evidence-based support to global education sustainability. ECCE is the first and major stage of education that children experience in their lifetimes; one that is crucial to setting up a child for successful long-term development. Many people eventually forget their experiences in these early stages, but it is crucial to note that ECCE is the foundation for the educational, physical, and mental well-being of children. To enhance my understanding of local systems for my research, I volunteered in India and Tanzania in the summers of 2015 and 2016 and experienced the different environments in which children around the world receive education. The experiences I have encountered during these visits have made me realize the significance of our generation helping each other. While volunteering directly in Jaipur, India, our volunteer team focused on care and building projects at an underfunded school. We built an additional classroom for the school, allowing for separation between grade levels for more focused education. In addition, we renovated outdated facilities at different schools, helping to improve standards for a better educational and hygienic environment for students. We also played with the children at schools and orphanages to increase student’s interactions in English. 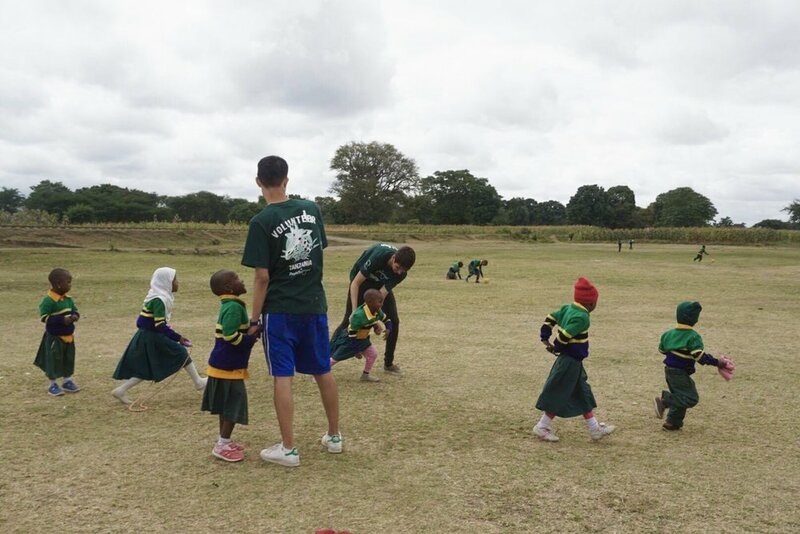 My trip as part of a volunteer team to Arusha, Tanzania also focused on similar commitments through care and community works at an ECCE center, serving as a teacher’s assistant in Mathematics and English classes during the school day and playing with students during time off. In these volunteer works, interactions and conversations with the locals have allowed me to better understand and experience children’s educational situations in various communities. From these experiences, I undertook an initiative to research the cognitive development of children and found that numerous factors, from a community’s perception to statistical factors such as government budget, affects the overall ECCE quality children receive. Furthermore from this research, I have learned that the primary goals of ECCE are all different depending on a community’s immediate needs, showing that ECCE can benefit not only from educational sustainability but also the sustainability of child growth and thus the community in general. For example, Indian ECCE programs in poorer districts focus on feeding children as their primary goal, while in Tanzania, preparing children for their primary education is the primary goal of ECCE programs. ECCE plays an important role in all places, but it is most crucial in developing communities as it is necessary for a child’s survival. Children in these developing communities will most likely lag behind those in developed countries; however, programs such as ECCE help reduce this “gap” that exists between the wealthy and the poor. Through using comparative analysis, interviews and personal observation notes, my research brings more awareness to the factors that make ECCE programs more effective. This research can be utilized to help create more efficient ECCE programs in developing communities and help the advancement of globalized sustainability. After considering these personal experiences and the research I have conducted, it is evident that many children in developing communities currently lack proper resources and mental support to fully utilize their intelligence and creativity: the very quality that stimulates the minds of young children and leads continuous innovation for humanity. Therefore, I am currently working on developing a non-profit organization that helps connect like-minded youths with our counterparts in other nations. This summer, I took an initiative to start building “Project Inspiration”, a long-term project that aims to incubate young children’s creativity and education. Through connecting underprivileged children in developing communities with people in the developed communities, this project will help foster and sustain these children’s creativity. The ultimate goal of “Project Inspiration” is to build a long-term and stable global community that provides educational support all year round. With the increased interconnectedness that is now possible due to advancements in technology, we must now create better educational standards globally. It is only in this way that we can continue to improve standards of living regardless of borders. The matter of sustainability applies to many different spaces - agriculture, environment, energy - but society must also prioritize human sustainability. With the help of youth-led research, the visibility of human sustainability must be brought further into public consciousness and there must be more awareness on the importance of education. Though our upbringing and individual experiences differ from cultural context, it is important to see that we all have fundamentally the same goal: to sustain and advance humanity. Education is a critical factor enabling the achievement of Sustainable Development Goals (SDGs), working towards a better educated and more globally aware generation. Education, and sustainability through investing in education, is self-sufficient, viable, and continuous. Having an ECCE program that can foster and maintain itself sets a stronger foundation for future growth and decreases the resources needed to achieve the same standard at a later time; fewer resources are depleted when addressed at an earlier age, allowing for a more efficient use of these resources. Better education for all children will bring with it the ability for them to grow as adults who are able to provide for themselves and improve the communities of which they are part of. This human investment will result in the improved sustainability of food, energy, economy, and environment. Looking ahead to 2050, ECCE programs can establish itself as a stepping stone for a healthier generation that better utilizes technological and medical resources currently available to our society: a more inclusive globalized society.